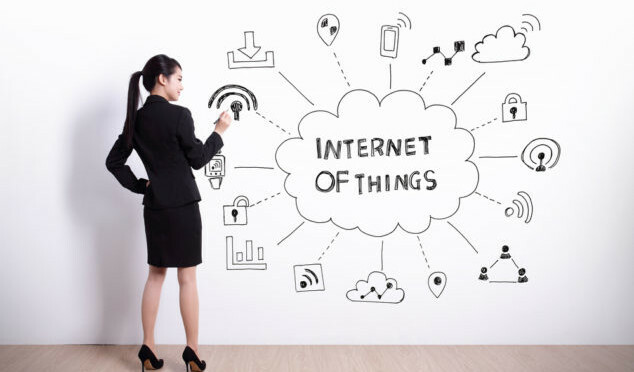 The “Internet of things” (IoT) is becoming an increasingly growing topic of conversation both in the workplace and outside of it. This concept not only has the potential to impact how we live but also how we work. Simply put, this is the concept of basically connecting any device with an on and off switch to the Internet (and/or to each other). This includes everything from cellphones, coffee makers, washing machines, headphones, lamps, wearable devices and almost anything else you can think of. The Internet of Things (IoT) consists of all the web-enabled devices that collect, send and act on data they acquire from their surrounding environments using embedded sensors, processors and communication hardware. These devices, often called “connected” or “smart” devices, can sometimes talk to other related devices, a process called machine-to-machine(M2M) communication, and act on the information they get from one another. Humans can interact with the gadgets to set them up, give them instructions or access the data, but the devices do most of the work on their own without human intervention. Connected devices also generate massive amounts of Internet traffic, including loads of data that can be used to make the devices useful, but can also be mined for other purposes. All this new data, and the Internet-accessible nature of the devices, raises both privacy and security concerns. This technology allows for a level of real-time information that we’ve never had before. We can monitor our homes and families remotely to keep them safe. Businesses can improve processes to increase productivity and reduce material waste and unforeseen downtime. Sensors in city infrastructure can help reduce road congestion and warn us when infrastructure is in danger of crumbling. The Philips Hue lighting system is the most popular of the smart device bulbs. It can change colors you choose, they’ll even match the tones in a photo that you upload via the app. They can also be turned on and off on a schedule or from your smartphone, and the Hue bulbs can even be synced with your music for an awesome sound-and-light party. Home Automation using Google Home or Amazon Alexa – These home control systems lets you control most of the electronic connections in your house through an app on your smartphone. It works irrespective of your location and is done over the internet. Security is a crucial issue on the Internet, and it is probably the most significant challenge for the IoT.When you increase the number of connected devices, the number of opportunities to exploit vulnerabilities through poorly designed devices can expose user’s data to theft, especially when the data streams are left with inadequate protection. The Internet of Things presents some unique challenges when it comes to privacy, and a lot of that goes far beyond the data privacy issues that exist currently. Much of this is because of the trouble integrating devices into the environments without people using them consciously. An absence of standards may well enable inappropriate behavior by IoT devices. Without the right standards to guide and regulate manufacturers, developers may design products that operate in any number of disruptive ways online without regard for their impact. When they are configured or designed poorly, these devices may have negative consequences for networking resources they connect to and, in the broader picture, the Internet itself. [Near Field Communication] is used to enable two-way interactions between the electronic devices. This is basically for the smartphones and is mostly used to do the contactless payment transactions. This is used where short range communications are enough to get away with the problem. This is mostly used in wearable technologies. This is a low power RF comm technology. This is primarily used for home automation, lamp controlling etc. This is the most commonly used choice for IoT. When on a LAN, this helps in transferring files, data and messages seamlessly. The device should be smart enough to push not only the notifications but also the error messages, warnings etc. The system should have an option to log all the events to provide clarity to the end users. If it is not capable of doing that, the system should push those as well to a database to store it.The notifications should be shown and handling of the display should be done properly in the devices [computers/mobile devices]. The system has to be available all the time and should have seamless connectivity. Connectivity, transfer of data, receiving job tasks from the devices should be seamless when the connection is UP and running. The other condition is the connection down scenario. Doesn’t matter how robust is the system and the network, there are chances that the system will go offline. Being a tester, we should test the offline conditions as well. As testers, we need to make sure the system performs the same even though the added data is propagated. Testing items such as, multiple operating system versions, browser types and respective versions, communication modes [For e.g. Bluetooth 2.0, 3.0] is necessary for IoT compatibility testing. IoT is a combination of multiple protocols, devices, operating systems, firmware, hardware, networking layers etc. When an upgrade is performed, be it for the system or for any of the involved items, thorough regression testing should be carried out/strategy should be adopted so as overcome upgrade related issues.